A recent report published last week by the US Department of Energy and prepared by Lawrence Berkeley National Laboratory (Berkeley Lab) found that wind energy pricing remains attractive due to technology advancements and cost reductions. The new report, the Department of Energy’s (DoE) 2017 Wind Technologies Market Report, found that newly built wind projects across the United States provided energy at an average of around 2 cents per kilowatt-hour (kWh), thanks a combination of technology advancements and cost reductions. As such, wind power capacity additions continued to accelerate through 2017 and, across the country, a total of 7,017 megawatts (MW) worth of new wind capacity was installed in 2017, with $11 billion invested in new plants. Overall, wind power accounted for 25% of all new US capacity additions in 2017 and contributed 6.3% of the nation’s electricity supply last year — as well as more than 10% of total electricity generation in 14 states, and more than 30% in four states (Iowa, Kansas, Oklahoma, and South Dakota, a fact highlighted by the American Wind Energy Association earlier this year). The DoE report also found that bigger wind turbines are enhancing wind project performance with increased capacity at lower prices, serving to only solidify the value of wind energy as a dominant player in the energy mix. 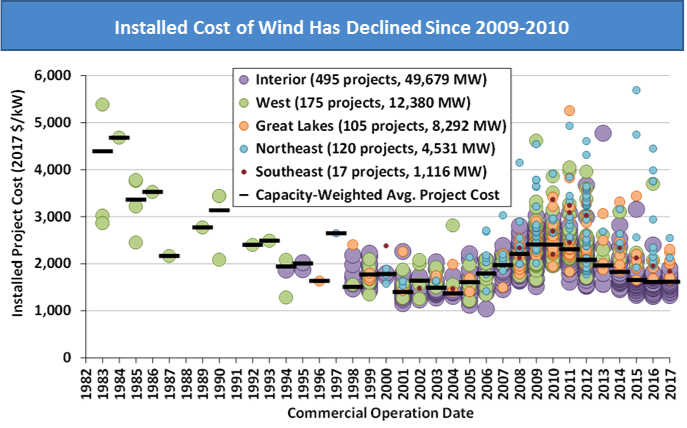 With increased development and innovation comes lower wind turbine pricing which, in turn, continues to drive down the installed cost of wind farms. According to the report, wind turbine equipment prices fell to between $750/kW to $950/kW, which are pushing down project-level costs. As such, the average installed cost of wind projects in 2017 across the US was $1,610/kW, down $795/kW from a peak in 2009-10. 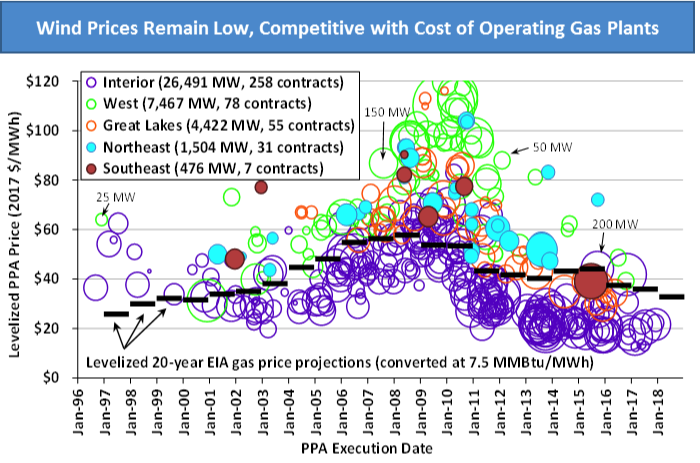 These lower construction costs have enabled aggressive wind power pricing, and after topping out at 7 cents per kWh in 2009, the average levelized long-term price for wind power has dropped around 2 cents per kWh. All of this leads to an important conclusion from the report, which predicts “Continued strong growth in wind capacity is anticipated in the near term,” thanks in part to federally available tax incentives. As such, various forecasts for US wind power capacity additions range from 8 gigawatts (GW) to 11 GW per year between 2018 and 2020, before a generally-agreed-upon market-contraction beginning in 2021 as tax incentives are phased out.